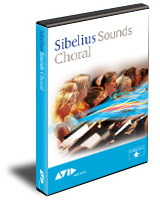 Choral from Sibelius offers a comprehensive range of high-quality sounds for choral music.The collection, which integrates seamlessly with Sibelius 6, includes ensemble sounds for soprano, alto, tenor and bass, with multiple vowel sounds for each, plus organ and piano sounds, all in stunningly realistic quality. The included Kontakt Player 2, from Native Instruments, has a host of adjustable settings so you can get just the sound you're looking for. You can even export an audio file to create a CD of your music, or convert to an MP3 file. The following sounds are included in the Choral selection. Requires Sibelius 6 and Sibelius Sounds Essentials. Windows XP 32-bit SP2 or Windows Vista SP1 or later, 1.1 GB hard disk space (in addition to Sibelius), 2 GB+ total RAM recommended, ASIO-compatible sound card recommended, DVD-ROM drive. Mac OS X 10.4.9 or later or Mac OS 10.5, 1.1 GB hard disk space (in addition to Sibelius), 21 GB+ total RAM recommended, Intel Core Duo processor or better recommended, ASIO-compatible sound card recommended, DVD-ROM drive.